One wintry day in February 1965, my schoolmate Rowan Conibeer and I decided to go fishing at the Brickfields (at the bottom of Chapel Lane). After about half an hour digging the frozen earth at the bottom of my garden in Homestead Gardens we decided we had enough earthworms to go fishing and off we went. Down Castle Lane, along past the piggeries, through the old World War Two gun emplacements (the actual guns long since removed) and we were there, at what we called The Canal (a small inlet at the eastern edge of the pond. I say pond because since those days I have learnt the dictionary definitions of both pond and lake. We always thought of the Brickfields as a lake back then, but as it was in fact created by the removal of clay for the brickworks it must in fact be a pond having no natural feed (as far as I am aware). Anyway, when we arrived at the Brickfields we discovered to our dismay, that it was completely frozen, a fact we hadn’t considered, despite the freezing weather. We did manage to break a small hole in the ice, so we set-up our gear and carefully cast our baited hooks into it. My friend Rowan soon got impatient and decided to go for a walk across the ice! I told him I didn’t think it a good idea, but off he went anyway, disappearing into the mist! After several minutes I heard the splintering of ice and a disembodied voice shouting out for help. Flipping heck I thought, he’s fallen in. My mind raced, wondering on the best course of action. Should I follow Rowan’s route as the fastest way across, or go round the edge as the safer of the two. Naturally, I didn’t know where on the pond my friend had fallen in, of if indeed he was still alive, as I had heard no more sound since that first shout for help. Sense, and I must admit a little cowardice, persuaded me the most sensible (and safest) route was round the perimeter, so off I went in a clockwise direction. This was not at easy as many bushes and trees had grown up along the water’s edge since the Brickfields had ceased production, many years before. In fact, half way round my path became blocked. I decided to try the opposite route and returned to my original starting point. When I arrived there and just as I was setting off again, there he was! Rowan appeared through the mist. Exactly at the point he had disappeared. My relief was immense as I had imagined the worst by this time and feared he had drowned, being unable to get back onto the ice. What in fact had happened, was that Rowan had got to the other side and the ice gave way right near the edge, where the water was fortunately only deep enough to give him a ‘booter’ as we called it. Like me, he decided the quickest route was the way he had come, so he merely stepped back onto the ice and squelched his way back across the ice. Quite whether this decision was based on logic, fear or just plain instinct, I will never know. In fact I’m sure Rowan didn’t either. Bizarrely, he thought the whole event was a bit of a hoot. Needless to say, we didn’t stay and complete our fishing as Rowan’s teeth were chattering louder than those joke false teeth you can buy in joke shops. And of course his feet and legs were freezing cold. Oddly enough, although I did go fishing a few more times after that day, I have never returned to The Brickfields to fish. 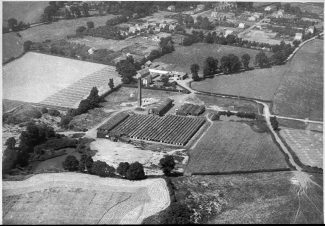 The young lad who drowned in the Blue Lagoon worked in the brick fields and was a relative of my mother, the Champion family of Benfleet. As with a lot of my generation our childhood was spent just as it has been described; even going out to the old jetty in my teens before we would fish for eels on the other side of the railway line. I think it would be reasonable to say the whole area from Leigh, Belfairs, Daws Heath and all the way to Benfleet was our back garden. We must have been some of the most fortunate kids in the country, something to do all the time. My mother and father ran the Colony lakes from the 1970s. I was about 6/7 years old. We started with the Blue Lagoon and what we called the small pond which was situated next to our farm house (Sayers Farm House ) my father was Barry Bull, he was the Dairyman-manager of that end of the farm and also successfully ran the colony lakes. He also had the Piggeries which are situated to the right of Piggery Lane. These he had dug out and got them stocked with all new fish. 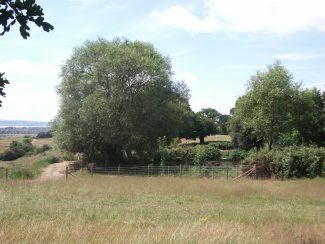 Eventually the small pond beside the house disappeared and was replaced with the reservoir. Again he then stocked the reservoir with fresh fish. He retired from running the fishing club around 1990; but remained living in the farm house up till 2 years ago . The lakes were a big part of my childhood for over 20 years. Me and my brother Darren know them lakes like the back of our hands. It was my dad who started it all and bought them all back to life. These ponds are on my daily walk; I go along the beautiful what you all refer to as Fitzwilliam Road, I’ve called it Cunning Murrell Lane for as long as I can remember. I fished the piggeries for years, a beautiful spot where you fish and all the wildlife comes to you. The Blue Lagoon is a beautiful but scary place; I remember a school lad drowning there so we kept a wide berth as we did with the Roman baths; those steep sides scared me and the brackish water I’m sure could not support many fish. Beautiful area though. We’re so very lucky to have the Castle and Park on our doorstep. I just hope they don’t over-sanitise it with this new hub and acres of car parking. The Brickfields have changed beyond all recognition since the 70s. Patrick is either referring to the Blue Lagoon fishery which was part of the old quarry behind Sayers (and was massive and a very strange shape at the eastern end) or the much smaller, and rather mucky, pond at the top of Snipes Lane which was the water source for Bricks 3 (roughly where the big reservoir is currently sited). This pond had a few Crucian Carp in it and, allegedly, eels, but the only attraction was that it was free to fish, whereas the Blue Lagoon always felt a bit Private (because it was). Loads of fishing floats were snarled in the overhanging trees – some mine! 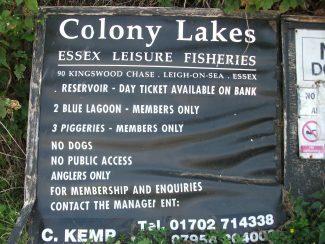 I’m assuming Patrick went past the two Piggery Ponds on his trip down Fitzwilliam Rd – these were accessible, but not great to fish in those far-off days. Further down Snipes Lane was the Roman Baths which was a silly name we gave to the Iron Pond, a brick-lined reservoir which was another popular place to drown maggots.The Blue Lagoon was distinctive because of its lush vegetation and crystal clear water and for it’s “professionally” built fishing jetties and “pontoons”. Brim full of fish: carp, tench, pike – but especially rudd, which were easy and fun to catch by us young ‘Erberts. I am aware of a number of High Jinks and Dangerous Escapades that went on over the Brickfields, but Patrick’s story definitely takes the biscuit!